Some of the CEAT truck tyre dealers on their visit to Russia. 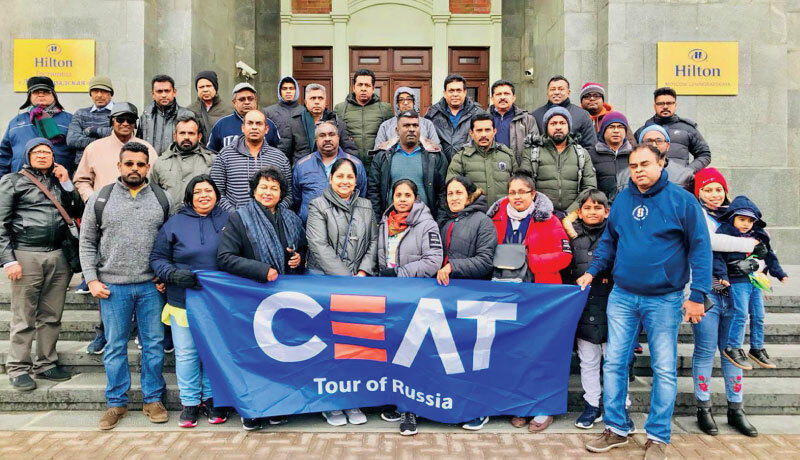 A tour of some of Russia’s most iconic sites became a reality for 40 CEAT dealers who had achieved a six-month target set by the tyre maker, for a truck tyre promotion that took place from June to December 2018. The target-achieving dealers were treated to an all-inclusive six-day tour recently, with stays at St. Petersburg and Moscow. The dealers also had the experience of travelling aboard the Sapsan high-speed bullet train connecting the two Russian cities they visited, and were treated to a tour of the Kremlin and a tour around Old Arabatknown for its architectural masterpieces and souvenirs. CEAT Kelani Holdings provided return air tickets, hotel accommodation, all meals, transfers within the tour and tour guide assistance. Notably, CEAT also launched a four-tiered loyalty programme titled ‘CEAT Privilege Class’last year tofurther strengthen its relationship with Sri Lankan tyre dealers. The programme confers rewards proportionate to the sales dealers generate for the brand. The first scheme of such depth and scope in the sector, this programme was set in place to motivate dealers to achieve and maintain tier targets and to progress upwards, earning greater rewards as they increase sales. Additionally, CEAT honours its top dealers for their contribution to the brand’s growth at a grand annual ‘Dealer Awards’ ceremony at which dealers are presented cash awards, trophies and certificates in recognition of their performances in each of CEAT’s product categories, as well as for overall excellence. CEAT Kelani’s manufacturing operations in Sri Lanka, encompasses the radial, commercial, motorcycle, three-wheeler and agricultural vehicle segments. The brand accounts for market shares of 33 per cent in the radial segment, 52 per cent in the Truck/Light Truck tyre category, 50 per cent in the Three-Wheeler tyre segment, 30 per cent in the motorcycle tyre segment and 72 per cent in the agricultural vehicle tyre category. The company exports about a third of its production to 16 countries in South Asia, the Middle East, Africa and the Far East.